Given that my phone is, well, my phone, and we crazy kids can’t last a day without them nowadays, I carry my phone around everywhere. Fortunately for me, I discovered the olloclip and I haven’t looked back since. I originally had the clip for the iPhone 5, along with the flipcase, but when I upgraded to the 6, it didn’t take me very long to get the upgraded clip — and thank god for the matching ollocase for it too. It’s slim but still has great protection with rubber bumpers – really great balance between flexible and sturdy. The 4-in-1 lens I have has Fisheye and Wide Angle capabilities, both of which can be unscrewed to use the lenses beneath as macros. A great upgrade the new lenses have is that the clip’s configured to have lenses work on both the back and front cameras of your iPhone! Clockwise from top left: 1 – Fisheye at Burrard Landing. 2 – Selfie by the Olympic Torch. 3 – Macro of medieval stained glass panel, The Met, NYC. 4 – A whole wall of Emily Carr artwork, Vancouver Art Gallery. 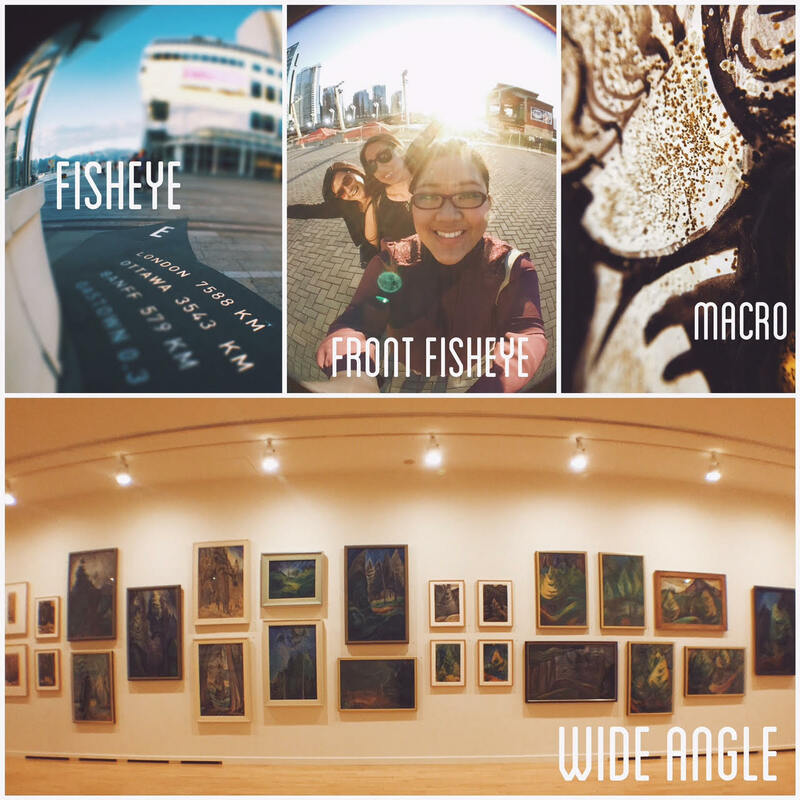 All taken with my iPhone 6 and the olloclip 4-in-1 lens. The results are amazing, and I think the olloclip leads the pack in terms of mobile phone lenses, both in design and output quality. You don’t have to stick a magnet onto your phone’s back for example, or carry around loose single lenses. 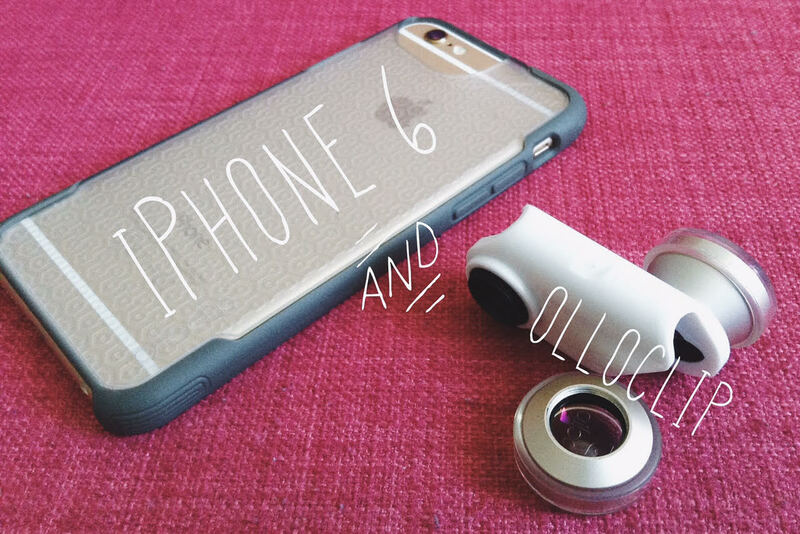 olloclip also has various other lenses, such as a telephoto lens, super-wide, etc., as well as lenses that fit older phone models, and even iPads and Samsung phones. In terms of portability and versatility, the 4-in-1 is my best friend. If anything, the one pitfall is that the phone either has to be naked or used only with the ollocase – fortunately I happen to like it! The iPhone 6’s camera has great photo results, and the video capabilities (including the timelapse and slow motion features) open so many doors to those who’d otherwise never download apps which do those things too. Bottom line: I don’t leave home without ’em. 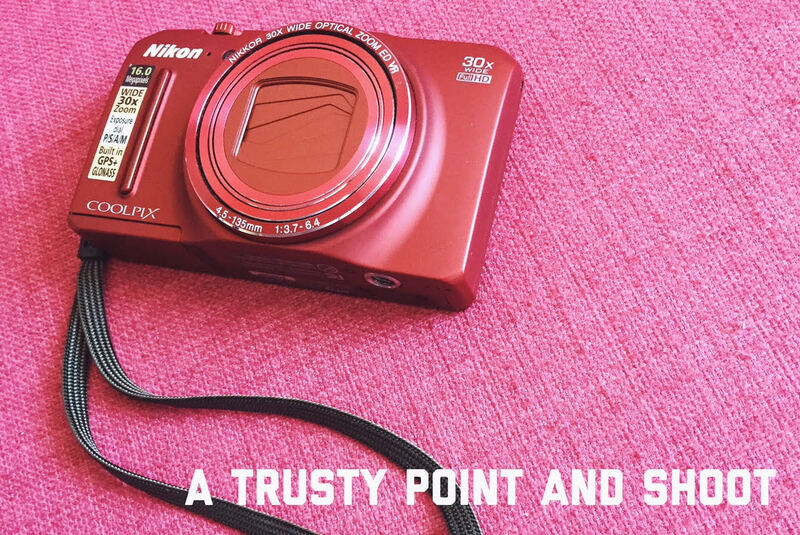 When you want to take photos a step up from your phone, there are several point-and-shoot cameras nowadays that fit the bill. You can get them in all shapes and sizes – waterproof, shatterproof, temperature-proof, wi-fi capabilities, GPS in it… you name it. There are also some out there that are the dinkiest wastes of money. So – don’t be afraid to ask questions, do research, and compare different models. Just because one works for me doesn’t mean it’s universal. I liked my Nikon COOLPIX S9700 (her name is Ygritte because she’s kissed by fire) because of her compact size and weight, as well as her wi-fi and best of all, her optical zoom. You can google the difference between optical vs digital zoom but the main point is that with optical zoom, you can get closer without sacrificing image quality. Phones, for example, have digital zoom (you don’t see any lens zooming in and protruding from your phone, right?) and the image quality becomes grainy or pixelated or plain gross. When I can’t get close enough for a shot, having the zoom this camera has is outstanding. Though many apps on phones nowadays allow you to use manual settings like you would on a camera, the output quality is still not as crisp or high resolution as you’d probably want, so having a decent camera like this (with the ability to do long exposures, self-timed shots, etc etc etc etc) is worth having. 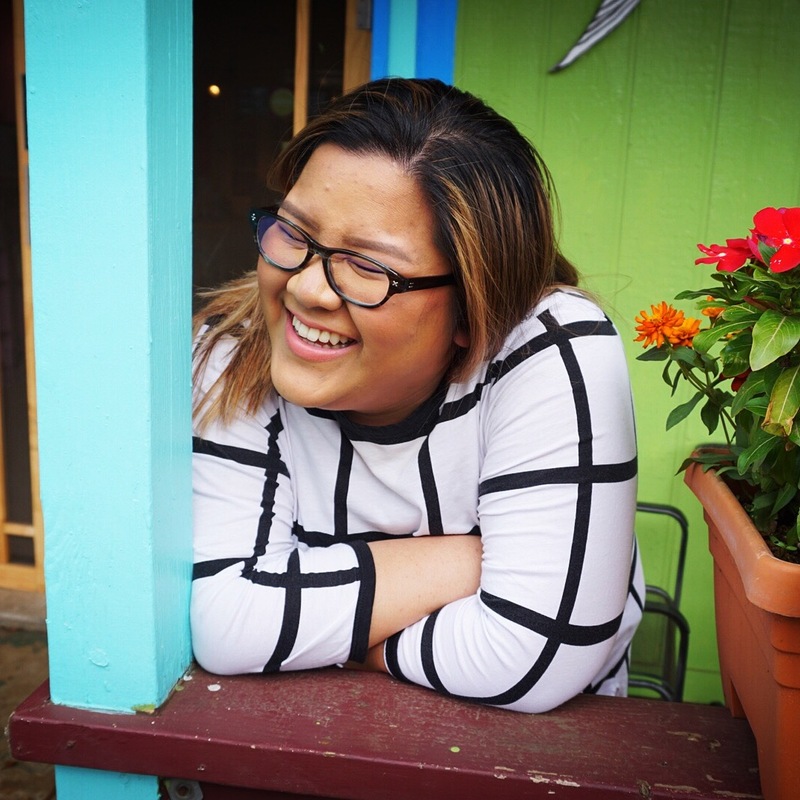 To many of you this may seem extraneous and unnecessary – especially if you’re bringing an SLR – but because I’m not, I like having her around. Plus, thanks to the wi-fi connection between her and my phone, I can email it or post on social media almost just as quickly as I can if I’d taken it directly with my phone! Talk about quick, hmm? Okay, I’ll be completely honest – I got my Fujifilm Instax Mini 90 for pure, 100% fun. The better looking, more compact, and yes, more expensive sibling of the Instax Mini 8, this camera prints out little wallet sized images for you to hold on to. The Mini 90 has some great features, however — like the ability to do double exposures as well as long exposures! It also has more settings for lighting, which gives the user more power to customize the results. Like most point and shoots / SLRs, this camera also has the 1/4″ thread which allows you to mount it on a tripod (and it has a self timer! ), runs on a rechargeable battery, and has a built in macro lens. Unnecessary? Maybe, to you. But there’s something about the unpredictability and art of film photography that is slowly being lost to the past, and unlike old Polaroids (and the impossibly expensive film for them), the Fujifilm is a surprisingly fun and cheap(er) alternative. There are other cameras out there (such as the Lomography Instant) which have several other lenses and custom options – so there’s an instant camera out there for every skill level (and budget). I’m looking forward to sharing the results of mine! Full disclosure: this is my second Narrative Clip. (Thanks for the gift, Karrie!) The first, a white one, is somewhere on the streets near Times Square (or, perhaps, now at the bottom of the Hudson). Partway through my trip to New York City, it slipped off my jacket and I lost it. Poop. Fortunately, I did get several hundred photos off it and though there were many duds, several unique gems were amidst it. 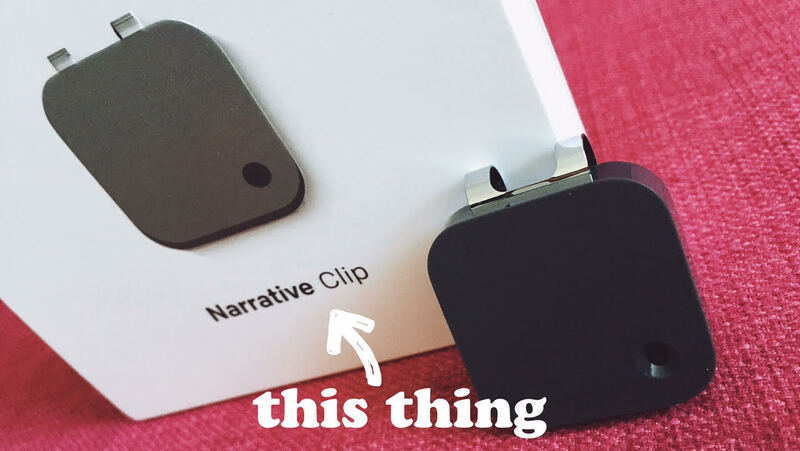 The way the clip works is simple. You clip it on, and every thirty seconds, it takes a photo of whatever it’s aimed at. If you want it to take a photo of something purposefully, simply double tap the surface. If you place it face down or in complete darkness (like a bag), it turns off automatically. Clockwise from top left: 1 – Strolling through NYC. 2 – Karrie taking a photo of a lovely Australian couple who just finished their lunch at Eleven Madison Park at the same time as we did. 3 – Karrie reviewing her shot of our epic foie gras dish. 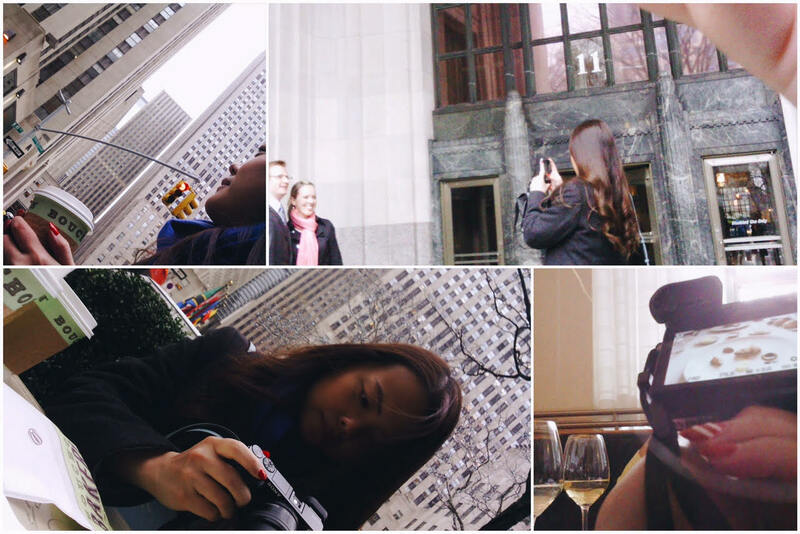 4 – While I noshed on a TKO at Bouchon, Karrie was (again) reviewing her photos. Alright, so the camera doesn’t take the best quality photos (it has 5 megapixels), but it’s a fun little gadget that captures moments that would have otherwise been overlooked or forgotten. Much like a film camera, you don’t know what you captured until you offload it (either onto your computer or into the cloud of the Narrative App – don’t worry, you can set it to private), which is part of the fun. The shots I’ll capture in the UK are going to be hella fun. NOTE: While I do own an SLR, and I do bring it on short trips closer to home, I’m not bringing it along with me on my monthlong excursion in the UK. It’s large, takes up half my purse, and it takes time to set up and fiddle with. The number of days I’m in the city and going to places where I wouldn’t be able to use it (museums and restaurants have gotten more and more strict with their policies on large “professional” looking cameras, whether you’re a pro or not) outweigh the days when it’s worth lugging around, and on that alone, I won’t be bringing her around for a month! My travel photography arsenal isn’t complete without all the little knick knacks that help taking all those photographs a little easier, so check out the little bits and bobs I’ll be packing along for my trip. The Anker 2nd Gen Astro E4 is one of the best-reviewed external batteries on the market at the moment, and the number one seller on Amazon. With two USB ports (yeah, you can charge your phone’s and a friend’s!) and the ability to juice up my iPhone 6 over 5 times completely, this battery that is smaller than a sunglasses case is a worthwhile bit of weight to add to my purse. Not only am I using my phone for photos (which, with taking and editing and posting, kills a battery pretty quick), I’m also using it as my GPS, to text, to call, to look at my itinerary on Google Docs, to check my emails… the list goes on and on. Doing all of those things on one device means you wouldn’t last through a day without a charge or two. Having the Anker on me means I don’t have to worry – even when I’m on a bus in the remote Scottish Highlands. No, no, I’m not selling Jon Snow to you. Jon Snow is but a keychain for my Muku Shuttr Remote. It connects to your Apple, Android, or Samsung device via Bluetooth, and from there, you can use it to control the shutter (or video start/stop) of your phone’s camera from up to 30 feet away! No more setting a timer then running to get in frame! This little guy allows you to set up, frame, then shoot. Easy as pie. Whether you use it as a kickstand or as a tripod mount, the Glif is the perfect add-on to your phone-ography arsenal. It’s adjustable to any width (so the tiniest iPhones to the largest Samsung or Nokia almost-iPads will have a snug and secure fit)! With its 1/4″ mount, that means I can make any standard tripod or monopod phone-friendly. No more balancing my phone precariously against random objects! Every big name (and small name) photography equipment company nowadays have baby tripods fit for travel, but my first (and the one I still bring around with me) is my Joby Gorillapod. Mine is the original, which means that weight-wise, it can’t really handle anything more than a phone or point and shoot (Joby now has larger ones which are stable enough for cameras as big as an SLR! ), but since they’re all I’m bringing, it’s the perfect tool for me. Whether I keep it low to the ground, on a tabletop, or gripping some railing or a branch, the gorillapod’s bendy arms keep my device secure. Paired up with the Glif or just using the direct 1/4″-20 mount my Nikon or my Instax have, all of my cameras have a baby tripod I can use! Obviously not suitable for SLRs or big epic shots – you may want something a bit larger to carry around for that – but this tripod is easily tucked away at the bottom of my purse and is extremely lightweight! Good luck stowing away a big tripod. This last item came in the mail a little too late (so I didn’t get a good photo of it), but I am bringing it so I’m sure you’ll be seeing it on my trip. The XSories U-Shot is a super lightweight, super small and compact monopod. Whether you just need a little more arm length (yes, okay, use it as a selfie stick), or you’re mounting it onto a small tripod to create a combo, the u-shot is a great addition to the pack. You can even use it in water (perfect for you GoPro-ers) and there’s a larger (longer!) one available for all you super selfie stick-ers. The main difference that sets it apart from your cheap drugstore selfie stick is its stability and ability to hold onto normal cameras (yay for the standard mount) as opposed to just your phone. So there you have it! All my little bits and bobs for travel photography. You’ll be seeing them in play here and definitely on my Instagram, so be sure to check ’em out there. 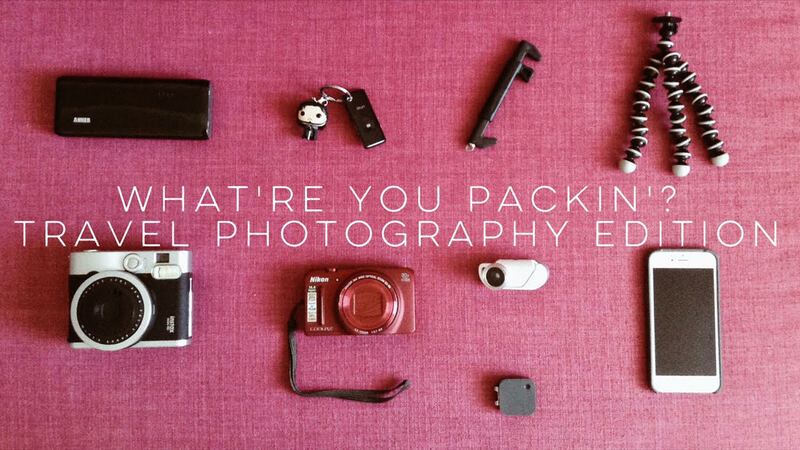 What photography tech do you pack when you go on trips? Let me know in the comments! This is a nice little haul of cameras. I’ve been eyeing up an instax mini for a while for fun… just wish the film wasn’t so expensive. As for me I’m all Nikon SLR and my iphone. I only ever pack my one lens because I like being forced to think about the photos I’m taking… especially since it’s a prime 35mm (well… 50mm on my camera). It’s chunky but it’s usually the only kit I take with me. Thanks Becca! 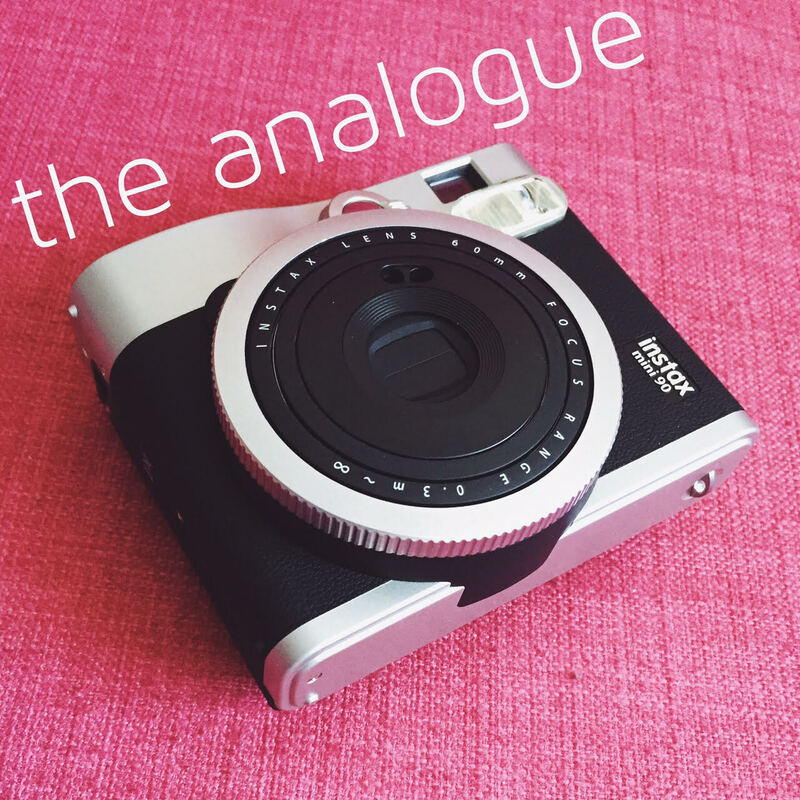 The Instax was definitely a splurge for me – I won’t be buying film for it too too often, that’s for sure. Again, I much prefer its pricepoint over the Impossible film! Yeah I get that. It’s a bulky bit of kit even without all the extras. I keep thinking of downsizing to a Four Thirds camera for the sake of size… maybe something like the Olympus OM-D E-M1. But it means giving up a few features and the effort of selling all the gear I do have for a good price to make the change worth it… ugh I think I’ll stick to my D7k. I’m lazy. And a little bit too in love with my camera. If I travelled as much as you do though it’d be a serious thing to consider.